Above is what Bachmann presented as a catalog image example for its DD40X in 1980. The 1980 Bachmann Catalog is the first to feature this model in the company's line. No train sets included the DD40X in 1980 and the image presented appears to be an Athearn DD40 decorated in Union Pacific's Centennial scheme complete with a DD40AX roadnumer 6922. What looks to be a production example of Bachmann's Centennial is found in the May 1981 issue of Model Railroader. Andy Sperandeo covers the highlights from the 40th Anniversary HIA (Hobby Industry Association) Show that happened in Atlanta, Georgia in the spring of '81. Bachmann's new products at the HIA Show in 1981 included: the HO-scale DD40X and BQ23-7 and a pair of N-scale steam engines (2-8-0 Consolidation and 2-6-2 Prairie). Bachmann's 1980 listing introducing the DD40X model includes two variations. One example is listed as being offered without Diesel Horn and it carried stock number 724; the other is listed as having an "Exclusive Diesel Horn Sound" and was the company's stock number 729. No retail prices are included for the model in the 1980 catalog. The next year, 1981, Bachmann includes an actual picture of their production model DD40X and the text for the 729 version also includes a note that the model featured a "Blinking Warning Light," in addition to the Diesel Horn. The numbering system utilized by Bachmann is changed beginning with the 1982 catalog. The former DD40X sans Diesel Horn (No.724) becomes Bachmann stock number 41-665-01; the full equipped example with Diesel Horn and Blinking Warning Light becomes 41-666-01 that year. The model remains the same roadnumber 6922 during this time in Bachmann's line. The '83 catalog includes retail prices and the DD40X with Diesel Horn had a $52.00 price tag; the no horn example carried a $38.00 retail that year. The N-scale example is introduced by Bachmann in the 1983 catalog, more info on that example is provided below. A zero is added to the middle digits of the stock number of both DD40X offerings with the 1984 catalog. Beginning with Bachmann's 1985 catalog a single DD40X is listed (No.41-0665-01) that includes "Exclusive Blinking Warning Light" and had a $38.00 retail. By 1987, the retail was listed as $42.00 for the DD40X. The early 1990s sees Bachmann revise its stock numbering system to a simplified 66501 from the previous 41-0665-01 for the DD40X. The 1992 Bachmann Catalog included a $55 retail price for the model. Bachmann's 1995 Catalog no longer lists the DD40X model, it would return with enhancements in the company's Spectrum line for the late '90s. The DD40X model first appears in a Bachmann train set with the 1982 catalog. The initial Centennial set cataloged only in '82 includes The DD40X pulling the 51' Pulpwood Rack Car with Logs; 62' 3-Dome Tank Car; 42' Steel Gondola; 51' Reefer Car; and Wide Vision Caboose. 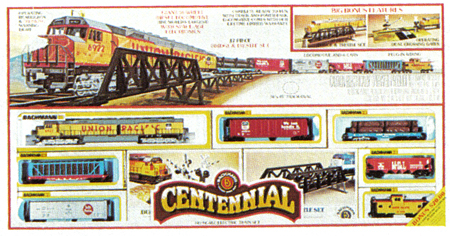 The 1982 Centennial set also included Bachmann's Blinking Bridge & Trestle Set; 36 pcs. Railroad and Street Signs and Telephone Poles; 19 pcs. Curved and 5 pcs. Straight Track; Plug-In Terminal Rerailer; and UL Listed Power Pack, plus instructions. The 1983 catalog provided a retail price of $75 for this well appointed Bachmann train set offering and a new stock number (No.40-137). The '83 edition featured the DD40X pulling the 200-ton Flat Car with Logs; 51' Plug Door Box Car; 51' Reefer Car; Open Quad Hopper; Pulpwood Rack Car with Logs; and Wide Vision Caboose. The '82 set showed a Figure-8 track plan, for 1983 it was a 45" x 36" oval that included the 17 pc. Bridge and Trestle Set; Operating Dual Crossing Gates; Plug-In Terminal Rerailer Track; 11 pcs. Curved and 1 pc. Straight Track; UL Listed Power Pack and Instructions. Both the 1982 and 1983 catalogs noted a $5.00 Rebate is available for this set. Bachmann no longer cataloged the Centennial set after its pair of early '80s appearances. After moving up to Bachmann's Spectrum product line in the late 1990s, the DD40AX model was out of production for a number of years. At the 2008 NMRA Show, Bachmann announced the return of the DD40AX as part of the company's EZ-DCC equipped standard line of locomotives. The new run of DD40AX models includes the enhancements the tooling received during its life in the Spectrum line, plus the new inclusion of a factory-installed DCC decoder. The new Bachmann EZ-DCC DD40AX models carry a $125.00 retail price and are available with four different roadnumbers. The EZ-DCC Centennials arrived in August, 2009. An N-scale example of the DD40X is added to Bachmann's line beginning with the 1983 catalog. The N-scale model was first labeled as "DDA 40X" and later was called a "DD40AX." The model is listed as featuring Reversing Headlights and Blinking Warning Light and sold that year for $35.00. Bachmann's catalogs included an illustration of the HO-scale model throughout the '80s and into the 1990s. As with the HO-scale model, Bachmann adds a zero to the stock number in the mid-'80s (51-0665-01). The model had a retail of $37 according to the 1987 product catalog. Though I don't have any reference to it happening for the HO-scale model, Bachmann shows the N-scale example graduating to the company's Bachmann Plus line in 1995. An Undecorated model (No.11451) and three Union Pacific models (UP #6906 -No.11452; UP #6922 -No.11453; and UP #6938 -No.11454) are listed as NEW in '95 and had a $75.00 retail for the upgraded Bachmann Plus release.